This is the kind of crowd us Country Mice are most used to- a bevy of summer blossoms. 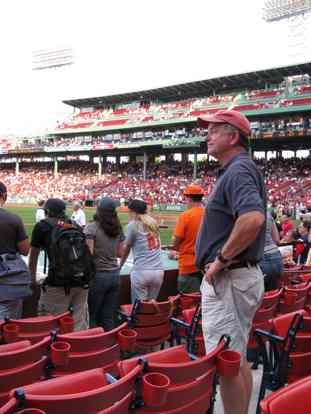 But last weekend, the dear man who has made our bottle boxes in all those playful colors for the last twenty years, Frank St Aubin of Bay State Box, gave us two tickets to a Red Sox game. He has been a fan for close to eight decades which gives him some serious street credit as a Red Sox die hard fan. And believe me, this kind of time spent as a fan is de rigeur to be considered a REAL fan. Jim found this out when he was 17 and mentioned to a old family friend that he was a Red Sox fan and the man told him in no uncertain terms that Jim had not been alive long enough to be considered a fan. As this suggests, going to a Red Sox game is a serious big deal to most people in northern New England. It certainly was a big deal for me and Jim. Most people we know can tell you exactly the last time they went to a game, where they sat, what the weather was, and then can share more stats from the game than anyone really needs to know. 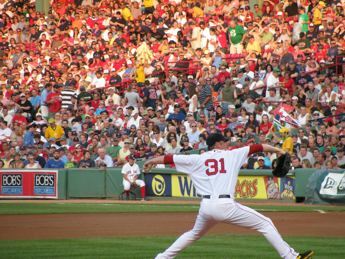 For me it had been a long long time since I went to a game in Fenway. In fact it was 1980 and I went to a Detroit game in the rain and sat behind one of the poles way way way up behind first base. 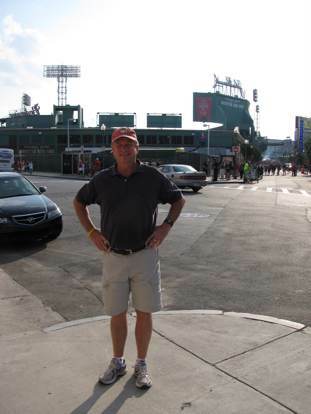 For Jim, it was June 1998 when Lizzie’s eighth grade class trip was a trip to Fenway on a hot Sunday afternoon. High points of this trip included one of Jim’s student’s throwing up the bag of candy he had just eaten ON JIM. Since we were lucky enough to get tickets for a Saturday night game, we decided to rendezvous with Emily on Saturday morning. She is working at a camp on Cape Cod this summer and we miss her! Being naive Country Mice, we did not expect the bumper to bumper traffic south out of Boston. To travel the twenty or thirty miles from Boston to Plymouth where we met Emily took us several hours!!!!!!!! In Meriden there are no traffic jams unless you consider the scene when it starts to rain and all the Honeybees try to get into the hive at the same time. I give all of you courageous people who face any other sort of traffic as part of your daily lives serious props for hanging in there. Nota bene: If I had to face that kind of traffic to get to water on a hot summer’s day, I would buy a kiddie pool and call it a day. The sea of people at Plymouth rock also startled us Country Mice. There was so much traffic we couldn’t do anything but drive by the hideous mausoleum plunked over Plymouth rock ( And what is that all about anyways? Does anyone really believe Miles Standish even saw that rock let alone step foot on it as he got off the Mayflower?). When we needed a cold drink, we couldn’t find anywhere to park to patronize all the inviting tourist filled smoothie cafes. Instead we had to go where apparently all of America is going, Ye Olde Dunkin Donuts in Ye Olde Gas Station. We really have this tourist thing down pat, don’t we? Soon it was time to leave Emily to fight her way through traffic back onto the Cape while we fought traffic back into and across Boston. It’s a city we have known for thirty years and still we found ourselves navigating across the city by looking out the windows to use the Prudential Center as our guidepost. Yes, we really are Country Mice. No Tom Toms, no GPS, not even a current map. Jim outside the shrine. At 52 maybe old enough to be considered a junior fan. 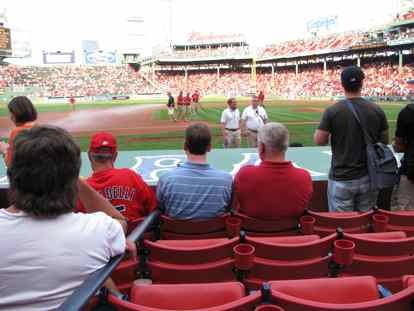 Look at our seats over the opposing team dugout. Leave it to me to be fascinated by the pre game turf management activities- the raking, the smoothing, the clipping, the watering. Here Jim watches as the place begins to fill with 38,000 people- more than we see in a year in our world. It was the only nice summer night in weeks and we were practically spitting distance to the field (not behind one of those green poles like last time). And the game was fabulous! We even saw Big Papi hit a three run home run! Jon Lester pitched a great game for us and my boyfriend Jacoby even stole a couple of bases for me. When Lester tired, we saw 100 mph pitches from the relief pitcher. And during any lull in activity, we yucked it up with the season ticket holders who wanted to know HOW ON EARTH we had landed such nice seats for the night. 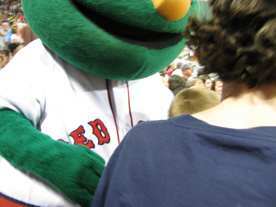 We also ate peanuts and cracker jacks and sang “Take me Out to the Ball Game.” At once point, Wally, the Green Monster mascot came over and gave Jim a hug. As a fellow animal, he must have recognized a serious Country Mouse when he saw one. Or maybe he was just trying to give Jim the gumption to take on Boston traffic one more time on our way home to sleepy Meriden, population 309. There are so many reasons why Jess is an Earth Angel. For example, here are notes from a staff meeting last week. My notes are on the left. 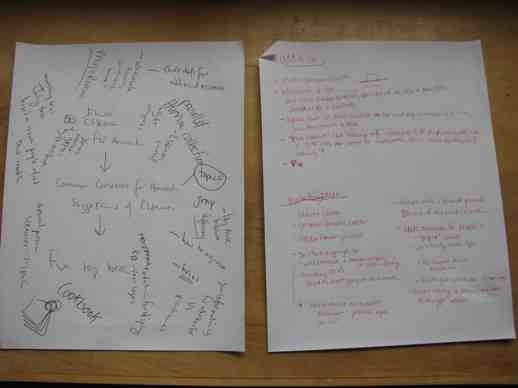 Notes taken by Jess on the right. I suspect that no further explanation is needed! Several years ago Ben started a group of wine grape test vines down below the Rose garden. For a long time not much happened to these miserable little vines lying limp on the ground. The weeds around the vines did much better and Sophie and I spent so much time down there weeding we told Ben that ANY wine he ever got from the grapes was going have to be named after us. Anyways, this year, while Ben walks the vineyards of La Rioja and other wine regions of northern Spain, all part of his Camino to Santiago de Compostela, his home town grapes have decided to spring into action and bear a lot of fruit. And the weeds? They aren’t so bad for some reason. Everything is coming into some sort of equilibrium. No doubt Ben will credit his grape whispering in the ancient vineyards along the Camino. 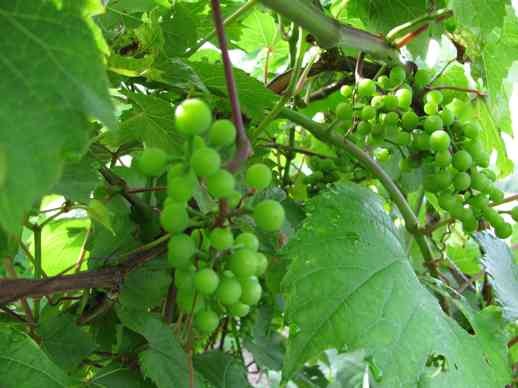 So……..while our harvest this year may bear little resemblance to the vendimia in Spain- no ladies dancing in big vats of grapes- Ben is going to return from his pilgrimage with a lot of grapes waiting for him! That and a lot of junk mail. The rest of the gardens are also doing their best with the little bit of sun we are getting. Here Konigin von Danemark gives us a gorgeous show. 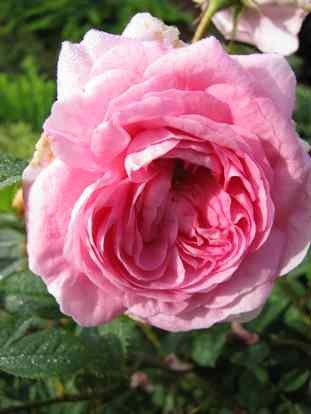 I love this Rose and its vibration that leads us away from perfectionism and shame spirals towards gentle self acceptance. 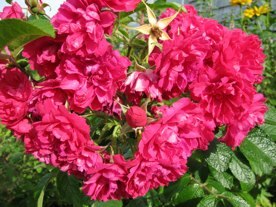 F.J. Grootendorst is another Rose that lingers with an endless supply of these generous clusters of summer joy. 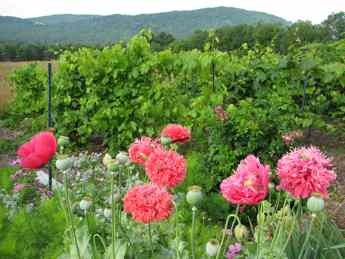 Here are Ben’s grapes with annual Pom Pom Poppies in the foreground. 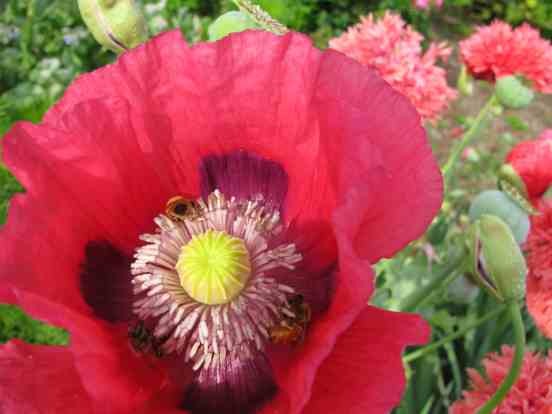 I can’t get enough of these Poppies, nor can the bees. We get the best mail. This summer it may be raining cats and dogs outside, but inside, as always, it is raining fun, beautiful, informative, supportive mail! So many of your letters, cards, and emails share your experiences with the Flower Essences. What you share is always so much fun to read. Thank you one and all! We deeply appreciate each of you that takes the time to tell us your healing stories! Here’s an excerpt from a note we got yesterday. It reminded us that all our efforts to find Flower Essences for hair issues were worth it. 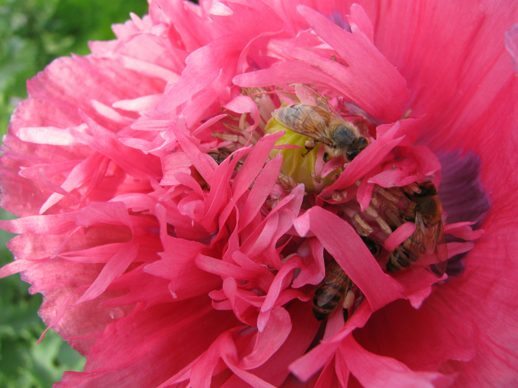 The Flower Essences she ordered? Claret Cup, Cedar, Cotton, Bog Cotton, Madagascar Periwinkle, Ocotillo, Digestive Woes, Desert Gold, Healthy Coat, Beautiful Skin and Vitex. Nicely said! 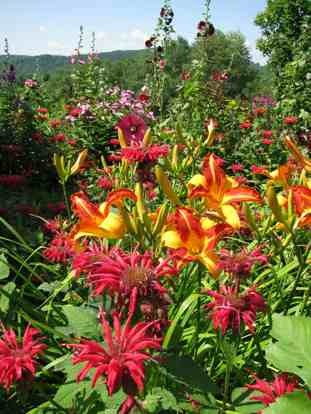 And now I am going to start my day with a glass of water containing all the unusual unexpected and inexplicable Flower Essence choices of the Angels! And after finishing off most of the Red Shiso, they have moved on to the lettuce, spinach, chard, hostas, marigolds, kale, peppers, eggplant, cabbage, broccoli. 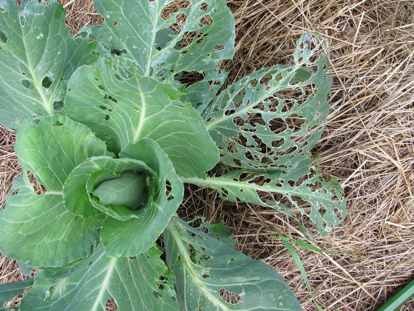 At this point, between trips to the local farm stand for vegetables, I begin to wonder, is there anything besides crab grass that slugs don’t eat? I am not alone in my musings on these meaty existential questions. At the farm stand yesterday, they ALSO were talking about slugs and their futile attempts to make slugs more appealing, even cute by calling them, “hitchkhikers.” Apparently at the pick your own strawberry part of their operation, the slugs are all over the berries and this PR is not really improving the situation. 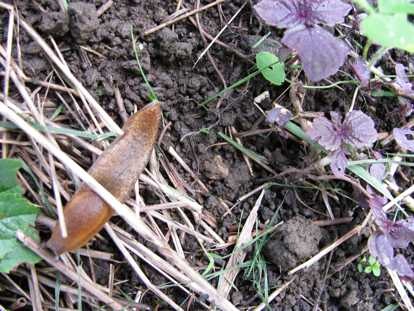 Let’s face the sad truth, there is nothing cute about slugs. There is hope that the slug population will recede as we have finally seen the sun for a few minutes. It is almost freaky to see a bit of blue sky and have a few blessed moments of sunshine. 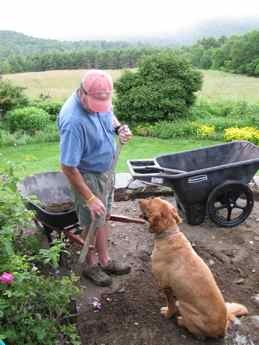 And the few moments of sunshine were not much consolation to May May and Jim who have worked on the stonewall patio project in “heavy mists and light drizzle” because their only other options were working during deluges, floods, thunderstorms, or downpours. Is it really any wonder that another Sheehan has taken off for Spain where the pilgrimage trail promises sunshine and heat? And when I took this shot of Ben about to head to JFK on the train to NYC, I had to acknowledge the good sense of Will, who is looking like he might leap that train with Ben and head out on the Camino himself. Now there’s a hitchhiker that might qualify as cute.